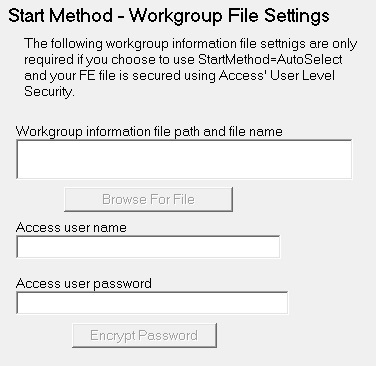 The following MDW entries are required if you choose to use the Start Method set to Auto Select and your Access FE database file is using Access' User Level Security. 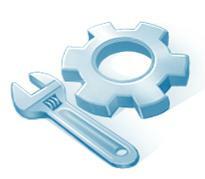 These are also required if you want to view the users in a secured backend Access database file. This contains the path and name of the MDW file which you used to secure the Access front end MDB. This should be kept on the server as suggest by fellow Access MVPs who know a lot more about Access user level security than I do. If there are any spaces in the folder path you will have to put double quotes around the path and file name. If you are only using the Start Method set to Auto Select then this user only needs the Open Exclusive permission on the database object. If you want to view the users in a secured backend database file then the user specified needs Administer permissions on the database object. This would usually be a member of the Admins group. Note that when you click on the Encrypt Password command button or run this utility for the first time it will replace the password with the text "(Password is encrypted)" and create an MDWPasswordEncrypted entry in the configuration file. Should you decide to change the password in the future replace "(Password is encrypted)" with your clear text password. The utility will automatically update the MDW Password Encrypted setting to the new encrypted password.